Did you pre-order the iPhone 5 between Sept. 14 and Sept. 16? Chances are you’re an AT&T customer. 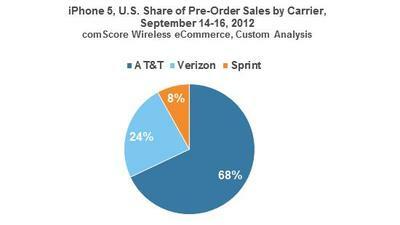 At least, according to a new comScore study that recently revealed the majority of iPhone 5 pre-orders were for customers who subscribe to AT&T. What kind of majority? 68%. Verizon gobbled up 24% of the pre-orders and Sprint took the remaining 8%. Why did AT&T have such a large slice of that pizza pie? comScore puts it eloquently. comScore also suggests we look at the bigger picture that remains outside of pre-sale numbers. It said AT&T had 48% of online sales during the three-day period following the iPhone 4S launch while Verizon had 35% of sales, followed by Sprint in at 17%. However, at the end of the iPhone 4S launch month, Verizon had 45% of all online sales, followed by AT&T (43%) and Sprint (12%). In other words, Verizon could very well flip the tables by the end of September.